The pioneering solar aircraft has completed the first flight of its kind across the Atlantic, proving that the latest generation of sustainable technologies can enable a new era of environmentally friendly transport systems and solutions. Seville, Spain, and Zurich, Switzerland, June 23, 2016 - Earlier today, Solar Impulse, a groundbreaking solar aircraft, completed a 71-hour transatlantic flight from New York to Seville in the course of its remarkable round-the-world journey, which began last year in Abu Dhabi. The airplane relies on the newest generation of solar cells, batteries and lightweight composites to accomplish the once seemingly impossible task of flying around the globe without consuming any fossil fuels. The project clearly demonstrates how new technologies are currently opening the door to a new era of fully sustainable transportation. One of the aircraft's two pilots, André Borschberg, remarked, "This aircraft is essentially a flying smart grid, using the energy collected from renewable sources and then providing it efficiently to users who may require it at a different period of time from when it was generated." Solar Impulse, which has a wingspan greater than a 747 but weighs about as much as an ordinary passenger car, uses a high-capacity lithium-polymer battery system to permit it to fly through the night as well as in full sunlight. The project's other pilot, Bertrand Piccard, who is Solar Impulse's initiator and chairman, said, "The world could be much more efficient if all of these technologies were implemented on a wide scale. This is exactly what our partners at ABB are doing - applying these innovations in a way that the entire world can use them." In fact, Solar Impulse serves as just one strong current example of how advanced technologies are revolutionizing the world of transportation. ABB's CEO Ulrich Spiesshofer noted that the company provides an expanding range of products and solutions that increase the efficiency of transport systems while reducing their environmental impacts on multiple fronts. "At ABB, we seek to find new ways to run the world without consuming the earth," said Spiesshofer. Regenerative braking systems in electric trains, trams and other vehicles are also contributing to significant improvements in energy efficiency. ABB's ENVILINE product portfolio incorporates regenerative braking and other high-efficiency strategies to reduce energy consumption in direct current rail traction systems by as much as 30 percent. Electric buses and other EVs are now becoming much more practical and are rapidly gaining in acceptance thanks to the development of new fast-charging stations, which can recharge the battery packs in the latest vehicles in just minutes rather than hours. A new public bus system in Geneva and one currently under construction in Namur, Belgium, make use of fast-chargers from ABB to provide cost-efficient zero-emission transport. Urban e-mobility stands to improve air quality and reduce congestion in city centers around the world. Recent innovations have been providing more sustainable solutions in marine transport as well. ABB's Azipod propulsion systems, which place electric drive motors in submerged pods that extend beneath the hulls of large ships, deliver dramatic increases in efficiency and maneuverability. The company's OCTOPUS solution uses big data, smart sensors and advanced connectivity to provide guidance to ship operators on the most efficient routes to follow, while also giving warnings of potential hazards. 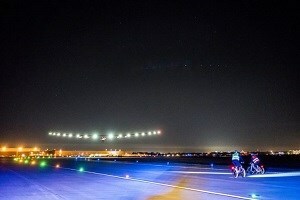 Solar Impulse represents just the opening stage of a new golden age of environmentally friendly transportation. "We are seeing huge new opportunities in the field of sustainable transport," commented Spiesshofer. "Recent technological developments are opening the way to major advances in energy efficiency and productivity. We are only just beginning to realize the full potential of these changes." ABB (www.abb.com) is a leading global technology company in power and automation that enables utility, industry, and transport & infrastructure customers to improve their performance while reducing their environmental impacts. The ABB Group of companies operates in roughly 100 countries and employs about 135,000 people.